The satisfying simplicity of sports is in the definitive result. A game is played. There is a winner and a loser and the winner gets a reward. Often that reward is to just keep playing. Those are the rules from the schoolyard to stadiums. It is a model that generally works great, just not necessarily for major college football. With some legitimate reasons, the sport is resistant to the simplest premise: If you win something, you get something. Five years into the College Football Playoff there is a lot of chatter about expanding the four-team field . Down the road, probably when its 12-year contract with ESPN runs out, the playoff will expand. Because there is always money in playoff expansion. Here’s a plan: eight teams. The Power Five conference champions get in automatically. Three wild cards or at-large teams picked by the selection committee, with at least one of them the best champion from the Group of Five conferences. Yep, nothing in there you probably haven’t seen before. Simple, but certainly not universally accepted, even among those who want a bigger playoff. Automatic qualification is an uncomfortable concept for fans who fear a conference championship game upset could give a precious playoff spot to a team that lost three or four regular-season games. 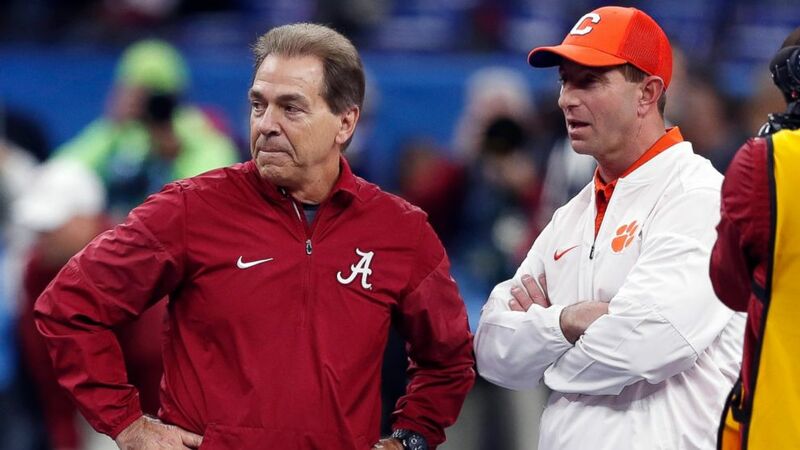 Automatic qualification also makes college football’s decision-makers squeamish because it was one of the downfalls of the Bowl Championship Series. Back then, six conferences had automatic entry for their champions, including the Big East. There was a cap on how many teams from one conference could be in the system. Tweaks were made to ensure teams ranked in certain positions were also guaranteed spots. It was kind of a mess, but the problems were not necessarily applicable to a playoff where all games have championship ramifications. The BCS increased college football’s national following, encouraging fans to pay attention to teams and conferences beyond their regions. The College Football Playoff aims to continue that growth and a bigger playoff, with automatic bids for conference champions, accomplishes that. Why reward anything less than excellence? Well, for one, Nick Saban is not going to be at Alabama forever. There will come a day when more than two or three teams in a given season could win a national title. Also, right now the College Football Playoff selection committee is taking an educated guess when it comes to what is excellent. That’s not criticism. The job of the committee is literally to guess the four best teams — a purposefully vague descriptor. It was easy to see Alabama and Clemson were awesome this season. They won all their games, earning the right to play more games. But on Championship Saturday, there were many who suggested Georgia was also excellent and deserved to be rewarded even after blowing a 14-point lead to Alabama in the fourth quarter of the Southeastern Conference title game. It was weird. Fortunately, the committee did not agree. College football does not comfortably fit the traditional win-something-get-something model. Wide variances in opponents mean all wins are not created equal. Not even close. There are few data points that can be used to connect and compare top teams from different conferences. This isn’t the NFL. But expanding the field with automatic bids to conference champions gets at least some of the guesswork out of the game. More objective. Less subjective. We can still argue about the committee’s wild-card selections. Debates about which team is best are part of the lifeblood of college football. It is why the Top 25 exists. But at some point the opinions have to yield to results or why even play the games? Think of it this way: The NCAA basketball tournament, with its imbalanced bracket, no reseeding of teams and one-and-done format, is a terrible way to determine the best team in college basketball. But it’s a fabulously entertaining event to determine a champion. Instead of obsessing over the impossible task of guessing the best teams, college football would be better served with a postseason built to determine a champion.